been a while since i got time to post something. after a sudden and draining trip to Boston, i decided to take the weekend entirely for myself. 75% of it was spent sleeping. the rest was cooking and eating. 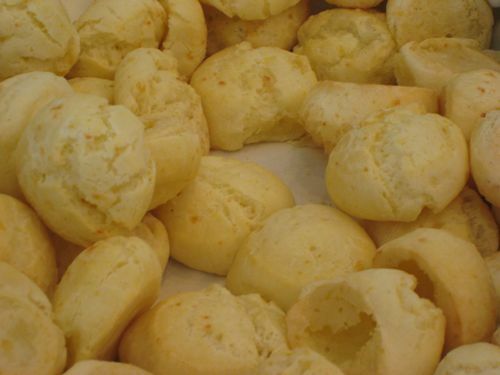 here’s the recipe i worked up for pão de queijo, a delicious Brazilian cheese bread. Mix the milk, oil and salt in a pan. Heat the mixture until the milk scalds and starts to boil over. Remove from heat immediately and stir briefly. Place the flour in a medium size bowl and pour the milk mixture over it, scalding the flour. Stir until incorporated and no large chunks remain, about 3-5 minutes by hand or 60-90 seconds by electric mixer with dough hook. Allow to rest until total time mixing & resting is no less than 5 minutes. Dough should be very chunky and crumbly at this point. Mix in the beaten egg until the mixture is consistent but still quite thick. Then, gently stir in the grated cheese. Dough should be sticky and thicker than cookie or biscuit batter, but workable. Prep a cookie sheet with parchment paper. Dip fingers in a bit of extra oil to prevent sticking and form small balls of batter approx. 3-5cm in diameter and place on cookie sheet. Bake until light golden brown, between 20 and 35 minutes. the cassava flour (aka yucca flour, aka “tapioca” flour but not what we know as “tapioca” in western culture) forms a special gluten that is safe for those with gluten sensitivities. the gluten has a particularly cheesy texture, which adds to the actual cheese in the recipe. if available, use 2 parts polvilho doce (regular cassava flour) to 1 part polivlho azedo (fermented or “sour” cassava flour). as far as i have been able to determine, it is not possible to substitute other flour types. find a Brazilian grocer, or get “tapioca flour” from an Asian grocer (it’ll usually be the right product). classically the recipe is made with oil as a fat source. some variants swap in butter for a “richer” taste. i’d avoid that. you could substitute some olive oil instead of the vegetable oil, but it might not hold up during baking. the selection of cheese is critical. traditionally this would be made with Minas cheeses from the Minas Gerais part of Brazil. the cheese recipes there were invented locally, but brought over and adapted from recipes from Italy in the late 19th and early 20th century. when not available, freshly grated Parmesan Reggiano is a good substitute. you could add a bit of a higher moisture content cheese to assist with consistency, such as a freshly grated Pecorino Romano, cotija or mozzarella. personally i find an all-mozzarella version strays too much from the original texture and flavour but it’ll do in a pinch. i have seen variants on the ‘net where people insert chunks of cheese in the middle. i tend to prefer the more consistent dough; the magic of this bread is that the dough itself has the cheesy flavour and texture brought about by the flour itself. if you want cheese-filled bread, try making bolinhas instead (recipe to come). i encourage you all to research this and post more experiments, especially with different proportions and ingredients! You say “no butter,” but what about using clarified butter? Butter’s just the wrong kind of fat for this…the flavour is off IMO. These things shouldn’t taste buttery rich…the emphasis is on the texture and the flavour from the cheese.